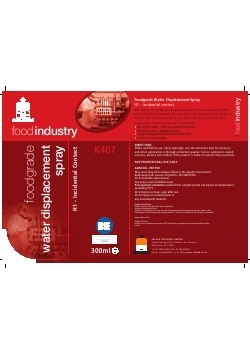 A NSF registered Foodgrade Water Displacement Spray containing PTFE which effectively displaces moisture and water based fluids and leaves a residual film of lubricant, for use on slides, bearings and other light applications in food processing environments. Shake well before use. Spray sparingly. Use the extension tube for accuracy and when application is through protection guards. Test on painted or coated surfaces, plastics and rubbers if the product is liable to contact these materials.